The Reverend Dr. Matthew Daniel Jacobson was celebrant and preacher at the Solemn Mass on Sunday, September 30, 2018. Among our guests were Rebecca Vander Meulen (L), executive director of the J. C. Flowers Foundation, Constance Njovu, regional coordinator for the Issdell:Flowers Cross Border Malaria Initiative, based in Lusaka, Zambia, and Bishop Andre Soares, Anglican Diocese of Angola. This is an unusual issue of The Angelus as it is being completed on Monday, October 8, 2018. Pastoral work is the priority of your parish priests. And it was pastoral work and our hosting of a special conference that has caused the delay in publishing our weekly newsletter. (This issue is dated October 7, and some of the information herein, including the music discussed in Dr. Hurd's note, concerns events already past. The next issue of the newsletter, we hope, will be published on Friday, October 12, as usual). First, I want to tell the parish community that the request for bids to do the restoration work on the 46th Street façade has gone out. A walk-through with our architects and interested contractors is scheduled for Thursday, October 11. Finally, we are taking the next important step forward. Next, I want to thank everyone who made it possible for the Society of Catholic Priests of the Episcopal Church and the Anglican Church of Canada to have their tenth annual conference here at Saint Mary's. Sixty members of the society attended. 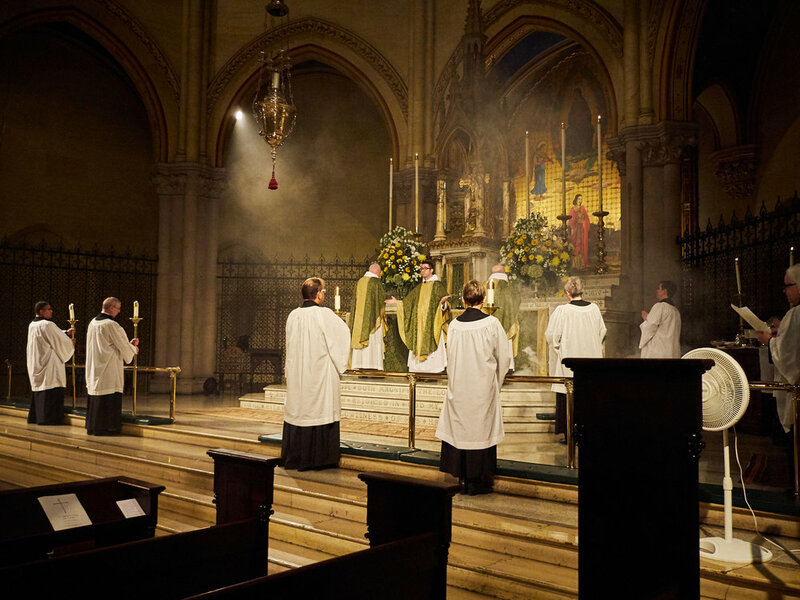 The conference began Wednesday night, October 3, at Saint Thomas Church Fifth Avenue for Evening Prayer, Eucharist, a reception, and a dinner for the conference attendees. We were especially grateful to the rector, the Reverend Carl Turner, for being our host and to the associate rector, the Reverend Matthew Moretz, for taking care of us so well. It was a wonderful evening of worship and fellowship. The conference continued at Saint Mary's on Thursday, October 4, the Feast of Saint Francis of Assisi, through Saturday morning, October 6. Three liturgical scholars presented papers on the conference theme: "Steeped in Grace: Baptismal Ecclesiology." It was a real honor for the Society to hear the Rt. Rev. Dr. J. Neil Alexander, dean of the School of Theology of the University of the South, where he is also professor of liturgy and the Charles Todd Quintard Professor of Theology; the Rev. Canon Dr. Lizette Larson-Miller, Professor & Huron-Lawson Chair in Moral & Pastoral Theology at Huron University College, London, Ontario, Canada; and the Rev. Dr. Maxwell Johnson, professor of liturgy at the University of Notre Dame. Zachary Roesemann, parishioner and resident iconographer, gave tours of his studio in the Mission House to a large group of attendees. The conference meant additional work for the servers, ushers, the Flower Guild, our musicians, and the parish clergy and staff. Their work was not unrecognized. There were many expressions of gratitude for the witness of Saint Mary's open doors and for the integrity of daily prayer and the regular worship of the church of our parish. The high altar flowers were given to the glory of God and in thanksgiving for the life and ministry of Donald Lothrop Garfield, priest and vii rector of Saint Mary's. Br. Desmond Alban, SSF, minister provincial of the Society of Saint Francis in North America, was with the resident brothers for Saint Francis Day and for the first Sunday in October. After Solemn Evensong & Benediction on Sunday, October 7, Br. Desmond asked Father Jay Smith and me to join him, Br. Damien Joseph, SSF, and Br. Thomas, SSF, in Saint Joseph's Chapel for a brief ceremony of prayer and blessing for the beginning of their ministry here. Br. Damien Joseph was recognized as "brother in charge" of this Franciscan household. I look forward to new ways their ministry and ours may grow. YOUR PRAYERS ARE ASKED FOR Michael, Jorem, Erica, Eloise, Donald, Irma, Al, Flor, Marge, Chandra, Greg, Alexandra, James, Karen, Carlos, Susan, Marilouise, Timothy, Barbara, Dennis, Robert, Abraham, Randy, Burton, Greta, May, Heidi, Takeem, David, and Sandy; for Rebecca, deacon; for Horace, Gaylord, Louis, and Edgar, priests; and for all the benefactors and friends of this parish . . . GRANT THEM PEACE . . . October 7: 1948 John K. Barnes; 1952 Robert H. Sommer; 1962 Stephen Waterman Mason. Mark Risinger was reader for the Mass. WOULD YOU LIKE TO BE BAPTIZED OR CONFIRMED? . . . The Right Reverend Andrew M. L. Dietsche, the bishop of New York, will be the celebrant and preacher at the Solemn Mass on All Saints' Day, Thursday, November 1, at 6:00 PM. If you have been thinking about baptism, confirmation, or about being received into the Episcopal Church, we would be glad to help. All Saints' Day is one of the four days each year when the Rites of Initiation-baptism, confirmation, and reception-are normally celebrated here at the parish. If you would like to be baptized, confirmed, or received on November 1, please speak to Father Gerth or Father Smith or call the Parish Office. THIS WEEK AT SAINT MARY'S . . . The academic-year schedule begins on Sunday, October 7, The Twentieth Sunday after Pentecost: Sung Matins 8:30 AM, Mass 9:00 AM, Adult Forum 10:00 AM, Mass 10:00 AM, Solemn Mass 11:00 AM, Solemn Evensong & Benediction 5:00 PM. The parish choir will sing at all Solemn Masses through the Feast of the Body and Blood of Christ: Corpus Christi, on Sunday, June 23, 2019 . . . Friday, October 12, 6:30 PM, Centering Prayer Group, Atrium, Parish Hall, Second Floor . . . Saturday, October 13, 2018, 8:00 PM, Miller Theatre Early Music Series, Stile Antico: "Elizabeth I, Queen of the Muses." Music by Byrd, Dowland, Farmer, Ferrabosco, de Lassus, Sandrin, Tallis, Taverner, Weelkes, Wilbye, and Willaert. ADULT FORUM: WE WELCOME THE FRIARS . . . Brother Damien, SSF, and Brother Thomas, SSF, will introduce themselves to Saint Mary's and will discuss their work and ministry, their vocation to the religious life, as well as provide an introduction to Franciscan spirituality, theology, and practice in the Adult Forum on the four Sundays of October from 10:00 AM until 10:45 AM. The forum is held in Saint Benedict's Study. All are welcome. At coffee hour: Fr. Matt Jacobson (L) and Br. Damien Joseph, S.S.F, greet members of the congregation. AROUND THE PARISH . . . On Sunday, October 14, 2018, the Very Rev. Robert Willis, dean of Canterbury, United Kingdom, will be the preacher at the 11:00 AM Solemn Mass . . . We are grateful to all those who did so much to welcome the Society of Catholic Priests to Saint Mary's this week for the Society's annual conference. Both the members of the staff and the members of the parish worked very hard to make it possible for the members of the Society to worship, study, learn, spend time together-and share meals together. Saint Mary's put its best face forward, and we are very grateful to all those who made all of that possible . . . We are grateful to parish volunteers Clint Best and Gypsy da Silva, who provided much assistance while members of the office staff were on vacation . . . We still hope to receive donations for altar flowers on the following dates: November 18 and 25. If you would like to make a donation, please contact the parish office . . . Attendance: Last Sunday 305; Feast of Saint Francis 237. A FLOWER GUILD EVENT . . . On Tuesday, October 16, 6:30-8:00 PM, celebrity florist Peter Krask and the members of the Saint Mary's Flower Guild will lead, and host, a Floral Design Class here at the parish. Those attending the class will create an autumnal flower arrangement to take home that is suitable for the upcoming season! Mr. Krask, who often appears on NBC's Today Show, will demonstrate and teach how to select, prepare, and arrange flowers. Those of all skill levels, including beginners, are encouraged to attend: no prior floral design experience is necessary! All materials are provided, and complimentary wine and cheese refreshments will be served. $85 admission with proceeds to benefit St. Mary's Homeless Outreach Ministry. Due to space constraints and the desire for all participants to receive individual attention and assistance, the size of the class is limited to 25 students. You can read more about Mr. Krask on his website. You may register for this event online. If you have questions, please contact Peter Ruane. FROM THE MUSIC DIRECTOR . . . Tomás Luís de Victoria (1548–1611) is considered the most important Spanish composer of Renaissance polyphony. Victoria knew and may have been instructed by Palestrina (1525–1594) who was maestro di cappella of the Seminario Romano in Rome at the time Victoria was studying at the nearby Jesuit Collegio Germanico. During his years in Rome, Victoria held several positions as singer, organist, and choral master, and published many of his compositions. He was ordained priest in 1575 after a three-day diaconate. There are twenty authenticated Mass settings of Victoria in addition to two Requiems. Although the Missa Dominicalis, sung as the Mass setting on Sunday morning, has long been attributed to Victoria, it is considered spurious by some more recent scholars after recognizing elements in the music which appear uncharacteristic of Victoria's style. No alternative authorship has been determined. The Missa Dominicalis is an alternatim setting, that is, phrases of text are sung in segments which alternate chant with four-voice polyphony. In addition, the polyphonic segments are rigorous in their use of chant phrases as cantus firmus. The cantus firmus for the Kyrie (not sung this morning) and the Gloria is Mass XI, Orbis Factor, the plainsong designated for Sundays throughout the year. The cantus firmus for the Sanctus and the Agnus Dei is Mass XVIII, the plainsong designated for weekdays in Advent and Lent, and at Masses of the Dead. Giuseppe Ottavio Pitoni (1657–1743) represents a Roman musical culture of more than a century later than Victoria. Pitoni was born in Rieti but was brought as an infant to Rome where he studied music and sang in church choirs. He served at various times as maestro di cappella-or in similar capacity-at Monterotondo, Rieti Cathedral, and many churches in and around Rome. While at Assisi Cathedral, Pitoni devoted himself to studying the works of Palestrina whose influence is apparent in his own compositions. However, Pitoni's large musical output also reflected the stylistic fashions of his own day and included elements of concertato and polychoral writing. The text of Pitoni's motet, sung during the communions this morning, is Christus factus est, Philippians 2:8-9, which finds its traditional liturgical usage as the Gradual for Palm Sunday, Maundy Thursday, and Good Friday. The power of this scriptural passage, however, is not confined to those occasions, and it has been set chorally by many prominent composers over the centuries. Pitoni's setting begins in strict four-voice canon. The word mortem ("death") is extended and painted with characteristic chromaticism. This is balanced later by the bright coloration of the word exaltavit ("[God] exalted [him]"). STEWARDSHIP AT SAINT MARY'S . . . The Stewardship Committee has been hard at work, preparing materials for the annual stewardship campaign. We urge all of our members and friends to begin a process of prayerful discernment of their stewardship plans and practice. As you begin this discernment, please consider this thoughtful message from the president of the Episcopal Church Foundation, Donald V. Romanik, "Thanksgiving knows no season, which is why stewardship needs to be a year-round, life-long practice. Stewardship is our joyful and loving response to God's abundant generosity and an opportunity, as Christian disciples, to discern how we use all the gifts we have been given to support and advance God's mission on earth." Stewardship materials will be mailed in mid-October. If you have questions about stewardship, please feel free to speak to MaryJane Boland, Steven Heffner, Brendon Hunter, Marie Rosseels, or a member of the clergy. West 47th Street was closed on Saturday, September 29, so that new construction tower could be erected. OUTREACH AT SAINT MARY'S. . . Donations and volunteers are needed for our next Drop-in Day in late October or early November, and for the many requests for assistance between Drop-in Days. We are in particular need of basic items such as the following: packs of new underwear in various sizes for both men and women; slacks for both men and women, including jeans, chinos, khakis, etc. ; packs of new socks, white and black; rainwear; knapsacks; and toiletry articles. Please contact Father Jay Smith if you would like to volunteer for this important ministry or if you would like to make a donation . . . We continue to receive nonperishable food items for our outreach partner, Saint Clement's Food Pantry. Please place those items in the basket near the ushers' table at the Forty-sixth Street entrance to the church. We are very grateful to all those who continue to support this ministry. A BOOK LAUNCH . . . Stephen Morris, formerly an Eastern Orthodox priest who served as chaplain at Columbia University, recently published a book entitled The Early Eastern Orthodox Church: A History, AD 60–1453. Saint John's Church in the Village is hosting a book reading and signing to mark the publication of Stephen's book. The event will take place on Monday, November 12: Evensong 6:15 PM; Book Reading and Signing 6:45 PM. Saint John's is at West Eleventh Street and Seventh Avenue here in Manhattan. Stephen is a good friend of Saint Mary's, who has taught in our adult-education program. TWO WALKS TO FIGHT ALZHEIMER'S DISEASE . . . Parishioner Michael Reid is once again participating in two walks in order to support those living with Alzheimer's disease as well as those seeking to find treatments for those with suffering with Alzheimer's and other dementias. The first walk, for Caring King, will take place on Sunday, October 14 in Riverside Park. In order to make a donation follow this link. The second walk, for the Alzheimer's Association, New York Branch, will take place on October 27, from South Street Seaport to City Hall by way of the Brooklyn Bridge. In order to make a donation, follow this link. Michael writes, "I am participating in these walks for the over 5 million Americans that have Alzheimer's and am raising awareness and funds for programs, services, support, and care for all New Yorkers. Last year, I lost my mother, Jerry Reid, to dementia, only to find out when notifying the family that my aunt Verna Mae Reid, was then in hospice care for Alzheimer's. I will walk this year to honor them and the other friends and family members I have lost to Alzheimer's and related dementias over the years. Thank you for your support." Ingrid Sletten, one of the artists for the current exhibit in Saint Josephs' Hall. THE VISUAL ARTS AT SMV . . . An art exhibit entitled "Spirit's Flight" is now on view in the Gallery in Saint Joseph's Hall. Members and friends of the parish are invited to join the artists and to see their work. All are invited. This exhibition features the work of two artists, Deborah Holcombe and parishioner Ingrid Sletten. Ingrid and Deborah's work, in different ways, explores the intersection between nature and the spirit. They have subtitled the exhibition "More Than the Eyes See: Combining Science with Revelation." An Artists' Talk for this exhibition will take place on Thursday, October 18, 6:00-8:00 PM. CONCERTS AT SAINT MARY'S . . . Saturday, October 13, 2018, 8:00 PM, Miller Theatre Early Music Series, Stile Antico: "Elizabeth I, Queen of the Muses." Music by Byrd, Dowland, Farmer, Ferrabosco, de Lassus, Sandrin, Tallis, Taverner, Weelkes, Wilbye, and Willaert. From the theater's website, "Queen Elizabeth I presided during a time that delighted in the talents of some of the most renowned composers of the Renaissance, including Thomas Tallis, William Byrd, and John Dowland. The exquisite Stile Antico explores the reign of the great Tudor Queen in a program illuminating the life of a court that rejoiced in some of the finest music ever created." For more information and to purchase tickets, you may visit the Miller Theatre website . . . Saturday, October 20, 2018, 8:00 PM, New York Repertory Orchestra (NYRO). NYRO returns to Saint Mary's for another season. On October 20, the orchestra will play music by Clyne, Mussorgsky, and Mendelssohn. Admission is free, but a donation is encouraged. Visit the orchestra's website for more information . . . Saturday, November 10, 2018, 8:00 PM, Miller Theatre Early Music Series, Cappella Pratensis: "The Josquin Imitation Game." Music by Josquin des Prez and Ockeghem, Van Ghizeghem, Busnoys, Willaert, and Gombert. From the theater website, "Josquin des Prez paid homage to his predecessors through the use of imitation. By the same token, subsequent composers played this game as a deliberate tribute, utilizing the same texts, melodies, and other characteristics of his music. The acclaimed Cappella Pratensis, known for their period interpretations, makes their Miller debut with a program anchored by Josquin masterpieces and exploring some of the great polyphonic works of the period by composers who inspired Josquin and those who were later inspired by him. Flowers at the ushers' table. LOOKING AHEAD . . . Thursday, October 18, Saint Luke the Evangelist, Morning Prayer 8:30 AM, Noonday Prayer 12:00 PM, Mass and Healing Service 12:10 PM, Evening Prayer 6:00 PM, Mass 6:20 PM . . . Tuesday, October 23, Saint James of Jerusalem, Morning Prayer 8:30 AM, Noonday Prayer 12:00 PM, Mass 12:10 PM, Evening Prayer 6:00 PM, Mass 6:20 PM . . . Monday, October 29, Saint Simon and Saint Jude, Apostles, Morning Prayer 8:30 AM, Noonday Prayer 12:00 PM, Mass 12:10 PM, Evening Prayer 6:00 PM, Mass 6:20 PM . . . Wednesday, October 31, Eve of All Saints' Day, Evensong 6:00 PM . . . Thursday, November 1, All Saints' Day, Sung Matins 8:30, Noonday Prayer 12:00 PM, Sung Mass 12:10 PM, Organ Recital 5:30 PM, Solemn Pontifical Mass 6:00 PM . . . Sunday, November 4, 2018, Daylight Saving Time Ends. AT THE GALLERIES . . . At the Metropolitan Museum of Art, Fifth Avenue at East Eighty-second Street, September 22, 2018–January 13, 2019, Armenia! From the museum website, "This is the first major exhibition to explore the remarkable artistic and cultural achievements of the Armenian people in a global context over fourteen centuries-from the fourth century, when the Armenians converted to Christianity in their homeland at the base of Mount Ararat, to the seventeenth century, when Armenian control of global trade routes first brought books printed in Armenian into the region. Through some 140 objects-including opulent gilded reliquaries, richly illuminated manuscripts, rare textiles, cross stones (khachkars), precious liturgical furnishings, church models, and printed books-the exhibition demonstrates how Armenians developed a unique Christian identity that linked their widespread communities over the years. Almost all of these works are on view in the United States for the first time; some have not travelled abroad for centuries.